Sorry for the delay in a new post, but with Hurricane Irene coinciding with my move in at Rutgers and a return to LSAT prep, free time has been at an all-time low. But now that I'm settled, posts will be coming more often as of next week. Also, since I've been reunited with my roommate Cynthia, as well as my other girlfriends at Rutgers, I'll have plenty of extra hands to use for swatching. I might actually have to build myself a lightbox! 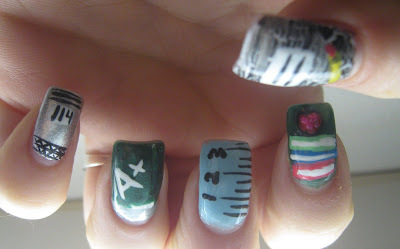 Anyhoo… this manicure is one that I did in honor of my return to classes this week. I didn't want to do Rutgers-themed nails yet (I'm saving that for the football game), so instead, I opted for the traditional images associated with a return to school. In the above photo, it's kind of hard to see the thumb nail, so I did a close up on the thumb below. It's actually really easy to do the marble notebook and anyone with a crackle polish can do it. I added in a pencil so it was more easily recognizeable, but it's not required. For the notebook, I painted black crackle from left to right instead of from bottom to top to get the sideways marble effect. I left a rectangle in the middle in order to act as the label for the notebook. 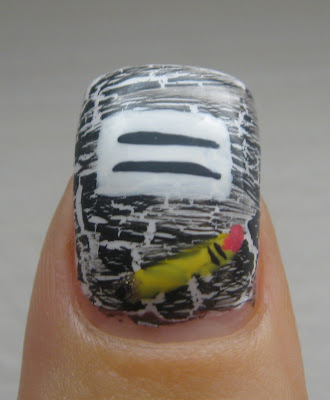 If you find you left too little room, like I originally did, you can use white polish to extend your rectangle. I'm a big fan of the Art Club nail art polishes (an extension of Color Club), so I used a lot of those paints in this look. I also use Art Deco by LA Looks, Kiss Nail Paints, and a host of others I find in different dollar stores. But the great thing about nail art like this is that you can use different colors from what I used, based on what is available to you, and still have an awesome outcome. Cause really… who didn't have a pink or purple marble notebook because they got sick of black? I hope you're all enjoying your first week back at school, work, or just your day in general. I know these nails have been the hit of my campus and I hope they will be for you too!